And revenge is a dish best served stuffed: Another Kropserkel original! 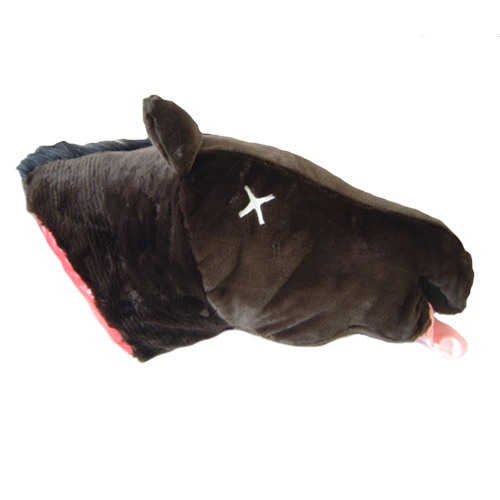 A custom severed horse head pillow™ plush that is actually quite comfortable to sleep on, albeit just a tad on the south side of morbid. A great conversation piece for the wannabe wise guy who has everything, and whose wife won't let them own a revolver. For that matter, something for the authentic wise guy that has a job to do, but has a soft side for the well being of animals. A great home theatre accessory as a tough guy's Teddy bear, aimed squarely at those with a diabolically dark sense of humor. Fans of the mob's harsh brand of communication can now unite and rest comfortably, if not uneasily. Send someone a message they will never forget without the risk of facing prison time for it. Finally, a gift you can send to your 'frienemies'. A better sleep with the fishes that is. Our horse heads can be packed with a customized personal note, and shipped to anyone you think deserves one. The horse head plush™ is the perfect reminder of the mistake they once made in wronging you, or for someone who just needs a good shaking up. Chomping at the bit to buy? Scroll down to order. Everyone knows somebody that deserves one of these, and really, at the end of the day, we're just flogging a dead horse here anyway, so just buy one!